Seattle’s five-year run of reaching the playoffs seems like fading history in the wake of its 42-7 obliteration at the hands of the Rams Sunday. The Seahawks have made five consecutive trips to the playoffs, winning at least one game, and taken the NFC West title three of the past four seasons. But all of that seems like fading history in the wake of developments Sunday at CenturyLink Field, where the Los Angeles Rams, 4-12 one year ago, obliterated the locals in a game that was effectively over midway through the second quarter. Most shocking about the Rams’ absurdly easy 42-7 victory: Two weeks earlier, the Seahawks dominated the NFL’s best team (by record), beating 10-1 Philadelphia 24-10. In addition, the Seahawks entered Sunday’s game having either held a lead or been within one score of the lead in the fourth quarter in 115 of their previous 118 games (regular season and playoffs) dating to the 2011 season. So it plainly didn’t figure that they would fall behind 34-0 at halftime, the second-largest intermission deficit under Pete Carroll. But given the way the Seahawks continued to botch offense, defense and special teams over the final two quarters, perhaps a bigger surprise than the 42-7 final score was that the Rams didn’t crush them by a lot more than 35 points. Historically dismal. As the Elias Sports Bureau pointed out, the 35-point win over an 8-5 Seattle team was the largest margin of victory by a visiting team over an opponent at least three games over .500 since December 1993, when San Francisco won 55-17 at Detroit (also 8-5). Not only was it the worst loss under Carroll, eclipsing a 34-point drubbing by the New York Giants in 2010, they sustained, by point differential, one of the seven worst whippings in franchise history, as well as the second-worst home loss, eclipsed only by a 38-point pratfall (41-3) to the Jets to open the 1997 season. Just about every number produced by the Seahawks Sunday was a terrible one, and never mind that they were missing four Pro Bowlers – CB Richard Sherman, SS Kam Chancellor, DT Cliff Avril and LB K.J. Wright – from a defense that had leading tackler LB Bobby Wagner only a shadow of his usual self due to a hamstring injury. 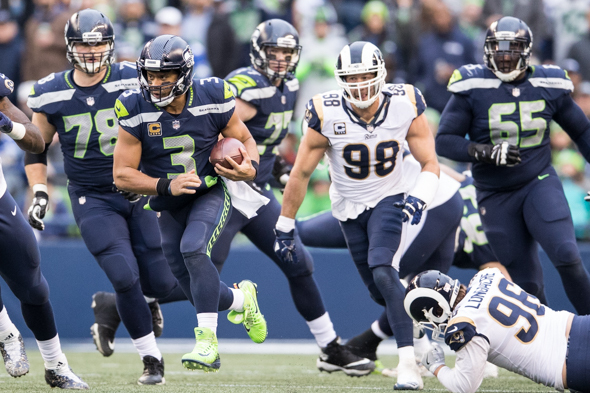 The Seahawks allowed QB Russell Wilson to get sacked seven times, his third career seven-sack game and second administered by the Rams (also Oct. 28, 2013). Seattle averaged 2.8 yards per play while allowing 5.2. Toss in nine penalties, two lost fumbles and a safety, while also ceding LA 180 punt/kick return yards, and the Seahawks were as hapless as they’ve ever been. Rams RB Todd Gurley had a lot to do with it as well. Gurley ran for 144 yards and three TDs in the first half, becoming the first NFL player with three rushing TDs before halftime since Joseph Randle of Dallas against Atlanta in 2015. According to Elias, Gurley also became the first player since Mike Anderson of Denver in 2000 to rush for 140 or more yards and score three TDs in the first half of a game (Anderson 146 yards, 3 TDs at New Orleans). Gurley finished with 152 rushing yards and four touchdowns after catching a 14-yard scoring throw from QB Jared Goff in the second half. Gurley is one of only three backs to deliver such a performance against Seattle, specifically: 150+ rushing yards, three rushing TDs, one TD reception. The second-most impactful Ram was either DT Aaron Donald (three sacks, four tackles for loss) or punt returner Pharoh Cooper, a fourth-round pick in 2016 out of South Carolina. On nothing more than a whim, we’ll go with Cooper. Among his seven returns: a 53-yarder to the Seattle one-yard line in the first quarter, setting up Gurley’s first TD, a 26-yarder in the second quarter, setting up Gurley’s second TD, and another 26-yarder in the second quarter that preceded Gurley’s 57-yard TD run on third-and-20 (57-yard TD run on third-and-20! Certainly one of the season’s most galling breakdowns). “Cooper did great,” Carroll admitted. “He came in with really good looking stuff, good numbers and scheme. That was a huge factor in the game. Big field shifts. Seattle had one bright note: With one TD pass and 39 rushing yards, Wilson became the first quarterback in NFL history with at least 30 TD passes and 500 rushing yards in multiple seasons (also 2015), breaking a tie with Randall Cunningham (1990) and Cam Newton (2015). But given the ease with which the Rams manhandled the Seahawks, the outcome rendered Wilson’s feat moot and made it look more like the end of an era in Seattle than a one-off loss. We’ll see. For a deeper dive on that, see Thiel: Long storm of mistakes imperil Seahawks. After watching Matt Ryan last night I think there’s a good chance Atlanta will not win either of its last two games. So there’s that puff of hope. But Detroit could easily win its next two and that would finish the Hawks. Hard to say if Rodgers plays against the Lions. Probably not. Note that the Falcons won when the Bucs kicker missed a game-tying field goal that would have sent the game into OT. I hope I’m wrong, but I’m having doubts about the Hawks’ being able to recover mentally/emotionally from this debacle in one week. Young people are certainly more resilient than this old duffer, but . . . We’ll see soon enough. Regardless of playoff implications, it sure would be sweet if the Hawks could pull off a victory over Dallas, thus proving most “experts” wrong yet again.